July was a Blue Moon month (in fact, the Blue Moon, the second full moon in a calendar month, was yesterday, the 31st of July), so it is only fitting that we look at the Major Arcana card known as The Moon. We will compare The Moon to last month’s card, The Sun. First, we should quickly define and describe some terms. There are 22 Major Arcana cards in a Tarot deck, with numbers from 0 to 21; the Majors usually deal with broader and more far-reaching life experience issues, archetypes that are easy for us to identify with and connect with at some point in our lives. An archetype (pronounced “ark eh type”) is a generic, idealized model of a person, an object, or a concept which can be copied, patterned, or imitated. The term archetype often refers to one of two concepts: a “stereotype,” a personality type observed multiple times, especially an oversimplification of a personality type; stereotypes can be positive or negative, or an “epitome,” which is the embodiment of a particular personality type, especially as the “greatest” or “best” example of the particular personality type; epitomes can also be positive or negative. So archetypes present personality traits that are common enough to be known by us all, through images (rather than words) that contain symbolism that connects with our subconscious in a universal manner. Each of us can understand the symbolism of archetypes and connect with that symbolism because each of us has (or will) personally experienced these archetypes. Each Major Arcana card corresponds to an archetype, an image, a number, an element, an astrological sign or planet, a Hebrew letter, and a Path on the Tree of Life joining two Sephiroth. Let’s start breaking this one down. The Moon, the eighteenth of the Major Arcana cards, represents the archetype of dreams, instincts, and the anima. Like The Sun, The Moon is a source of illumination, but The Moon presents illumination without heat. The Moon is also seen as the archetype of feelings, emotions, and the mothering principle. The Sun may be about the conscious self, warmth, vitality and ego, but The Moon is about the soul, childhood, home, and family/community/tribe. The traditional image on The Sun is well-lit and bright, and hints at the masculine, but The Moon is usually more feminine or mysterious in nature. The traditional image usually shows two towers that at first glance appear the same, but upon more detailed consideration exhibit subtle differences. Of course, there is a Moon in the sky, often a Waning Moon, and the face on this moon is either androgynous or feminine. There are usually two canines howling at The Moon, one with short, smooth fur and one with long and more wild fur, representing the concepts of tame and wild. There is usually a body of water in the image, representing the subconscious, often with a lobster or crayfish visible, representing the unconscious mind, and the primordial and primitive (and often unexplained) impulse of life. The Moon is numbered 18. In numerology, the number 18 tells of tolerance, humanitarianism, the ability to sacrifice in order to achieve a goal, and the ability to perceive the world without judgment. Very different from The Sun, number 19 in the majors, which encourages us to use courage in order to deal with past issues and actively manifest blessings in our lives. The number 18 is also connected to secrets, and thus, to lies. The Sun corresponds with the element of Fire, which corresponds with the Minor Arcana suit of Wands, playing cards suit of Clubs, the cardinal direction of South and the color Red, and represents creativity, ideas, ambition, and growth. The Moon corresponds with the element of Water, which is not friendly to Fire at all. Water, which is connected to the suit of Cups, the Hearts of playing cards, the cardinal direction of West, and the color blue, is about emotions and inner manifestations, rather than the outer world. This element represents dreams, divine love, the heart and the subconscious. Water also represents purification and transformation, and being grounded in the heart rather than the intellect. Besides emotions and feelings, the element of Water represents our connections and bonds at many levels. This element can represent a caring and sensitive nature; it can also represent dreaminess and self-delusion, the presence of some emotional trauma, and possibly a refusal to address the hurt associated with that trauma. The Major Arcana Moon card corresponds with the astrological sign of Pisces. Pisces is a mutable sign, the twelfth sign of the zodiac, and it is also the final sign in the zodiacal cycle. Those born under this sign are selfless, spiritual and very focused on their inner journey. Feelings and emotions define the sign of Pisces, and empathic talents are common among the Pisces-born. This is also a sign of intuition and secrets, and of people who are comfortable in an illusory world (and comfortable jumping between that illusory world and logical reality). The symbol of Pisces is a pair of fish, representing the dual, yin/yang nature of this sign. Pisces is also a sign of the suffering that brings soul growth. The Moon is an interesting celestial body unto itself, and its traits deserve consideration when contemplating The Moon of the Tarot Majors. The Sun card corresponds with our sun, the star at the center of our solar system around which the planets revolve and which star is necessary for our very existence. The Moon revolves around the Earth rather than the Sun, and is our Earth’s only natural satellite. The Moon is thought to have formed approximately 4.5 billion years ago, not long after Earth, most likely formed from the debris left over after a giant impact between Earth and a Mars-sized body called Theia. The Moon is in synchronous rotation with Earth, always showing the same face. It is the second-brightest regularly visible celestial object in Earth’s sky after the Sun, and although it can appear a very bright white, its surface is actually dark. It is prominent in the night sky, and its regular cycle of phases causes it to appear to change shape. The Moon’s gravitational influence produces the ocean tides and the slight lengthening of the day. The Moon’s current orbital distance from the Earth causes it to appear to be the same size as our Sun (which allows the Moon to cover the Sun in a solar eclipse). In the Hebrew alphabet, each letter is connected to the creative forces in the universe. They express themselves on three levels: one level is archetypical and runs from the first to the ninth letter; the second level is one of manifestation and runs from the tenth to the eighteenth letter, and the third is a cosmic level and runs from the nineteenth to the twenty-second letter. The Moon corresponds with the Hebrew letter Quoph, the nineteenth letter in the Hebrew alphabet, a member of the cosmic group; this letter corresponds with the back of the head, which holds the primitive brain (which keeps the body running even during sleep), or with the eye (or hole) of a sewing needle. Either way, we are talking about darkness, or the Shadow Self, as opposed to The Sun, which represents the front of the head, where the eyes are located, and the ability to see where we are going. On the Tree of Life, The Moon represents Path 29, running between Malkuth (the physical world of action and physical, outer reality) and Netzach (the stimulating factors of emotion and inspiration). This Path connects the bottom of the Pillar of Force with the root of the Tree of Life, and tells of an energetic connection to all cycles and a perception of just what those cycles are. It allows us to see past the veneer of civilization to the eternal, primordial cycles that support it. The interesting thing here is that on the Tree of Life, the Path of The Sun, the next card in the Majors, represents the scientific discovery that validates the experiential knowledge of The Moon. Here we see another hint of soul growth that occurs during the Dark Night of the Soul, one of the possible meanings for The Moon, and then the illumination and sense of rightness that comes with the survival of that Dark Night found in The Sun. Imagination can be a creative catalyst, or it can be our downfall; what we believe to be true will most likely manifest itself in the end. The Moon tells of perceptions, and it tells of the falseness of many of those perceptions. Knowledge can either be false or true, and “truth” in the end is really “truth until proven to be false.” Fear is also connected to this card, and fear can easily overcome us. Or, it can make us stronger; after all, we don’t know if we are really courageous unless we experience real fear. Whether upright or reversed, The Moon maintains its correspondences. It is only our chosen response to the dreams and visions of The Moon that flavors the result as good or bad. Thus, a reversed Moon card can tell us that those dreams and visions won’t blind us to the truth, while an upright Moon card could be telling us that those dreams and visions will distract us. Everyone invited for the ritual was asked to wear either blue or white and to bring a potluck dish to share. They were asked to bring foods that were blue, white or purple (we needed another option). The exception to the rule was the meat main dish. One of the guys got creative and had a local bakery dye French bread blue. Our ritual was held out doors in a small tarmac area behind my apartment. We hung Celtic tapestries from the fence, stairwell and one from a stretched rope to block off an unsightly area. I also pulled out my large cauldron for burning our candles. No, the Blue Moon isn’t specifically Celtic, but I was working with my Celtic students and guests that evening. The altar was setup for the Three Realms and not the typical quarters/directions; only because I don’t work with them. You can set your altar in accordance with your personal practice. The altar is covered in a plain dark blue cloth. There are blue Hydrangeas at the head of the altar flanked by two leaded glass hurricanes with blue pillars. We used 3 iridescent globe hurricanes with blue tea lights and a tall frosted candleholder with a blue Celtic knot moon design placed in the center on a raised disk. A sage wand and small cauldron with charcoal are also on the raised disk. A vial of Sparkling Full Moon incense (which just happens to be blue), a small spoon, tongs to hold the charcoal when lighting and a lighting wand. The Sparkling I purchased it through www.sacredmists.com. Across from the cauldron, a blue vase holds silver gel pens. Under the vase are blue paper circles cut from scrapbooking paper, one for each person attending. 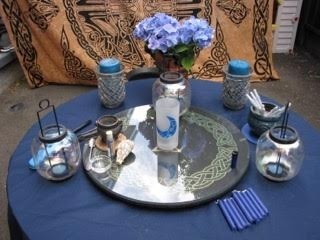 Near the front of the altar is a vial of Blue Moon oil (homemade) and blue 4” candles, enough for each person. We began our ritual as is customary with our tradition. When the time came we acknowledged Titania and Oberon by sprinkling moon & star confetti on the altar (which I had hidden in a bowl under the altar). A short introduction was given about why we were here and what we were going to be doing. Everyone took a few moments to meditate on their long-term goal setting. Then the pens and blue paper circles were passed around and everyone began writing down their goals for the Blue Moon. Some wrote straight across the circle and others spiraled their words around the paper. 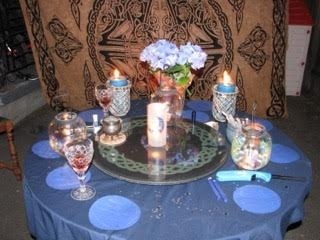 We anointed our papers and one of the blue candles with the Blue Moon oil. The paper moons were to be kept in a place where they would be seen everyday so that their subconscious mind could work on moving the energy along. They lit their candles and placed them in the cauldron to send their magical goals up and out to the moon. We ended our ritual per our custom and loaded up on food. What will you do for the Blue Moon? What are some of your long-term goals/wishes? What types of food will you have?